Thursday in Melbourne was another chilly winter day, but oh I have had such a nice day. As I am still in my challenge phase I thought it was high time to have a day when I just did stuff for me and just went with the flow. The day started of with a sleep in, followed by a lovely warm leisurely shower. After running a couple of errands it was of to pick up Rachel for our lunch date. I decided that we should head back to the “Donnybrook Hotel” so Rachel could experience a great meal like Shane and I had last week. But I did warn her not to order the steak, cause it is just way to big. As I mentioned last time this pub is in the country and is as pubs were before the pokie invasion. Once again the meals didn’t disappoint, Rachel had a Fishermans Basket (big enough for two people) and I had Garlic Prawns with Rice. My meal was also pretty big but was so so tasty I got through almost all of it. On the way home we had a drive and look around a couple of the new housing estates. Rachel has now headed of to the football with Shane and I have just had a chat to my boy Shane up in Cairns. Now it is time for me to relax in my PJ’s , and watch Masterchef on telly. I must say I have had a good Thursday. Tonight I thought I would share a piece of jewellery piece I made yesterday. What a delightful day, Davine! I like the way the Challenges make us think about things differently, which then allows us to do indulgent days like you have described! I LOVE your bracelet! It seems quite different from other pieces you've made. I am excited about seeing it in real life at the Expo. 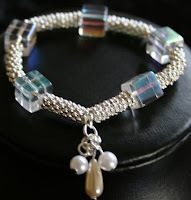 Very lovely bracelet, your work is stunning! Davine, You need to move to Ohio so that we can hang out together. You know how to have a lovely day. I need some girl friends like that.